As so many visitors always know when coming to Tasmania at this time of the year you can often experience many seasons in one day. The fickle weather should not be a deterrent, as this season holds a lot of potential for those who wish to see great gardens and some wonderful horticulture. There is an overwhelming amount of interesting and unique plants coming into their best over the next few months which will tickle the fancy of any ardent gardener, and for that matter, even those who don’t garden but just enjoy the experience of being in one of Australia’s premier horticultural hot-spots for nature’s annual showcase spectacular. The weather has stayed fairly mild and the rainfall has been very good throughout the winter and early spring and this has meant that many plants have been able to get a good growth run into the emerging spring warmth. It promises to be a unique year for many plants with potential for above average flowering and growth, all up ensuring a garden year that we have not experienced for many decades. 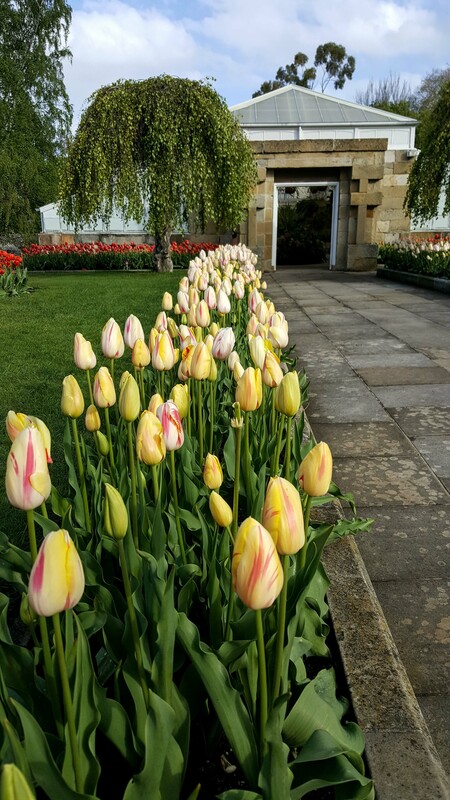 For those who just love these spectacular but specialised and relatively short flowering plants, they are still in flower at the Gardens, but hurry the time is ticking. Thousands of people have already enjoyed the fabulous display in front of the Gardens conservatory. The best time to visit is usually the morning and evening, which are also great times to take photos as the light is usually perfect. The native plants and especially the heaths, are really showing off in the Tasmanian native plants section of the Gardens. The weather has been ideal for them and they are starting to show why they are regarded as some of the most special plants in the world. These plants can be easily viewed from the all-weather pathways and you can get close to many of them to inspect the beautifully intricate flowers. Morning and evening visitors to this area often find that they are met by the fairy wrens and other small native birds that frequent this area. A great time to get some ideas on what to plant in your veggie or herb gardens. Take a trip down to the Tasmanian Community Food Garden to see the latest plantings and other horticultural undertakings being initiated by our specialist horticulturists as well as gardening personalities like Tino Carnevale and Gardens volunteers. It’s amazing how just a visit will inspire you back into your garden for a spring makeover, and at the same time there is an opportunity to gain some ideas from the gradually developing spring plantings. Our plants are once more in full glory with large plants flowering in both red and white forms. 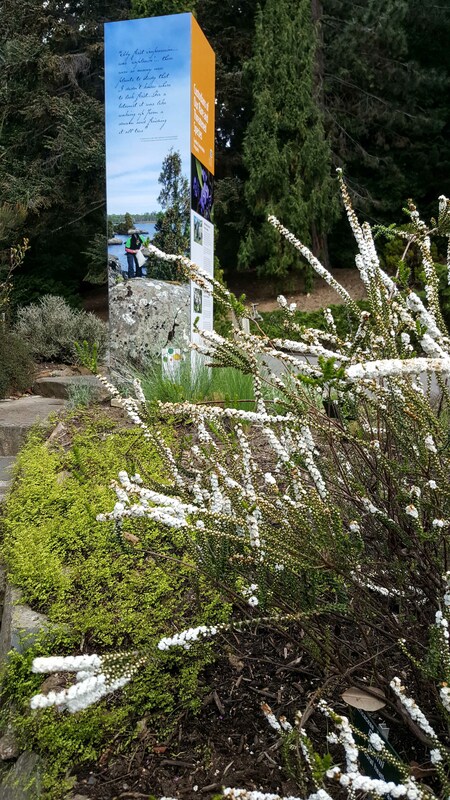 See our examples on the path up from the Visitors Centre towards the Lily Pond. 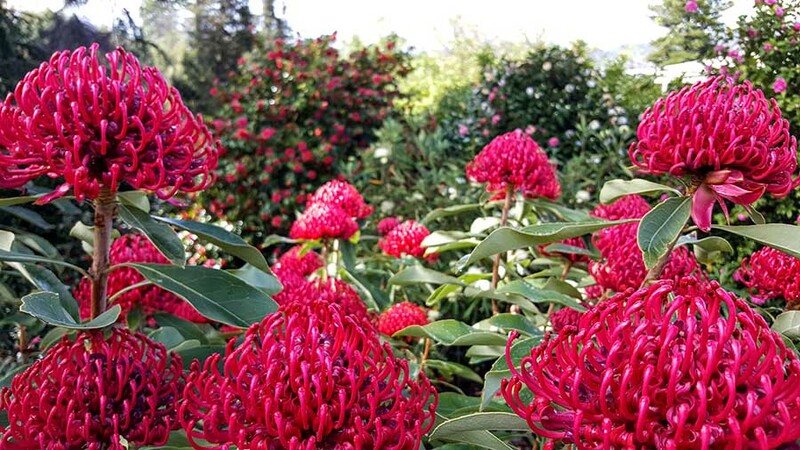 These glorious plants are cultivar varieties of the NSW species Telopea speciosissima, and are mostly of the cultivar known as “Shady Lady”. Once again some great photographic shots are available at certain times of the day, this being one of the most photogenic plants we have in the Gardens. The Friends perennial border garden is always a treasure, and although it is still early days in mid October it has special plants that feature all year. It is a great garden that offers wonderful inspiration to the aspiring gardener as well as a pleasure for all. The use of roses that are harmoniously intermingled with flowering perennials is always a worthwhile technique that ends up being a spectacular visual indulgence throughout the late spring and summer. These gardens are managed with an expert and caring hand that provides management, but without relentless micromanagement, allowing for natures hand to do the rest. 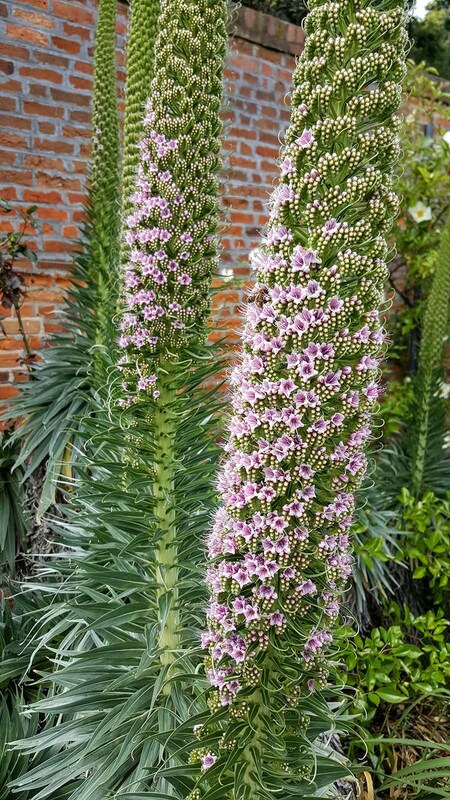 In October giant pink Echium thrusts skyward from where it has self sown a few seasons earlier, the lucky seedlings left to show off their magnificent glory. 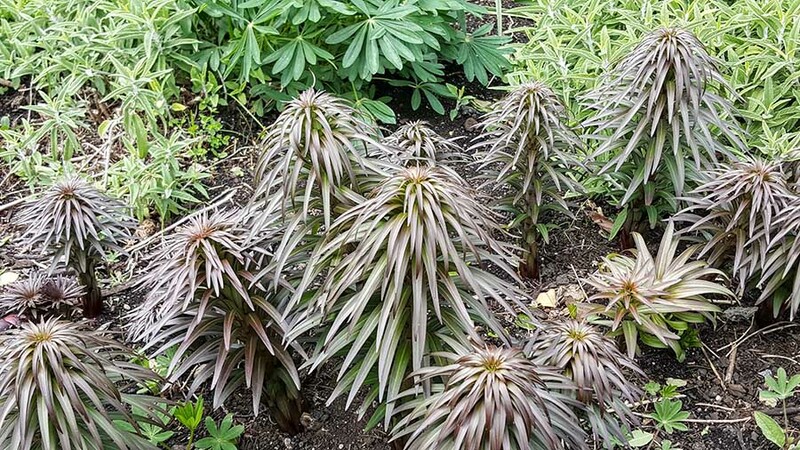 Young lily shoots sprout forth on mass from the mulched soil each one reminiscent of a 1960’s TV monster family sitcom character, their spectacular dark burgundy foliage a strong feature in the otherwise relatively bare areas of the garden.